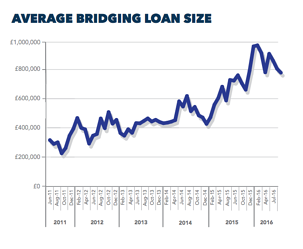 Gross annual bridging lending increased to £4.4bn in July following the Brexit vote, with a 3.3% rise in lending since June, according to the latest West One Bridging Index. With traditional high-street banks reducing mortgage lending by 12.8% year-on-year in July, borrowers have sought alternative forms of finance to fulfil their demand. Borrowers have increasingly turned to short-term finance to complete deals. The short-term lending market jumped 12.5% through March and April, with last minute purchases ahead of the early April deadline for Stamp Duty. Here, deals that wouldn’t complete on conventional buy-to-let mortgages needed bridging finance to complete, before later refinancing. 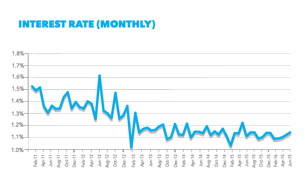 After this spike in demand, lending returned to a steadier rate of growth over the subsequent 3 months. With demand for bridging finance coupled with the residential property market, the 5.6% year-on-year growth in house prices in July ensured that demand for finance has continued to increase. The linkage between house prices and lending volumes occurs because rising house prices act as an incentive for developers to invest in the property market. Further, with rising purchase prices continuing to drive consumers to the private rental sector, landlords are also incentivised to invest in properties for both rental yield and capital gain. To do this, many smaller developers and landlords use bridging finance to purchase properties at auction, with traditional high-street lending taking far too long to allow completion within the 28-day auction completion window. Sustained levels of auction activity have been observed post-Referendum, for example with auctioneers Barnett Ross selling 87% of lots at their July auction, just 3 weeks after the Leave verdict. Rising house prices also encourage short-term borrowing because the capital gain on a residential home can compensate for the interest charged on the bridging loan. This is useful for small developers who require additional funding to get their property ready for sale. While the results of the EU referendum caused some initial slowdown, demand for property still outweighs supply – and will continue to do so. This should ensure that bridging lending continues to increase. While the residential market appears to be relatively unaffected by Brexit, the commercial market has slowed. In July, there were 1.7% fewer commercial property transactions compared with the same month last year. This represents the first year-on-year drop since April 2013. Concomitantly, there has been a dip in commercial demand for short-term finance as part of funding commercial developments. This has somewhat offset the positive residential sector’s contribution, tempering overall growth in the short-term lending sector to 3.3% in July. Nevertheless, the 15-20% post-Referendum fall in Sterling has made British property more attractive to foreign investors – a key source of funding for commercial developments. Commercial funds have also now lifted the suspensions in trading which were put in place in the immediate aftermath of the Leave vote. With commercial property still offering better yields than other investments, a revival in the commercial market looks likely, bringing accelerated growth in bridging lending into the autumn. Stephen Wasserman, Managing Director of West One Loans, comments: “Once the initial surprise of the Referendum subsided, bridging lenders got back to business. While some deals did fall through at the end of June, plenty of new opportunities have appeared. With funding from traditional lenders drying up, the short-term finance sector has stepped up to plug the financing gap. Small businesses have also sought additional finance over the last few months to tide over the slowdown after the referendum. As the economy shook off any Brexit worries, bringing lending has increased. The size of the typical bridging loan fell to £798,000 from £883,000 in May. This 9.6% decline was anticipated as lenders became more cautious after the Leave vote. The average loan to value ratio has also fallen by one percentage point since the referendum. This is only a slight decline as short-term finance providers have been lending responsibly and reduced exposure in the months prior to the vote, with the average loan-to-value ratio falling from 50% at the end of 2015. Stephen Wasserman adds: “After the referendum, lenders who kept a tight hold on the reigns during the first half of the year were able to weather the economic storm relatively unscathed. Those who remained committed to responsible lending were well prepared for the economic turbulence. However, others with more aggressive lending policies are now having to retrench in the face of liquidity challenges. While the leave vote may have surprised many, it was not unforeseeable. Robust underwriting standards, low loan-to-value ratios and rigorous assessment of exit strategies have enabled short-term lenders who prepared for both Referendum outcomes to thrive despite financial headwinds. This preparation involved securing high quality deals through prudent practices, which allowed some lenders to expand even in these lean months, while still remaining protected against future uncertainty. 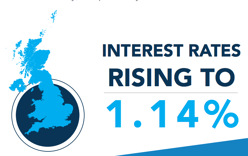 Interest rates have returned to 1.14% in July – the same level as May – after rising slightly to 1.16%. The competiveness of the sector has ensured that consumers have got the best deals possible, with rates remaining below 1.2% for the past year. The Bank of England’s decision to cut the base rate to 0.25% may lead to further falls over the coming months. As an investment opportunity, the short-term finance sector continues to exceed other forms of investment. 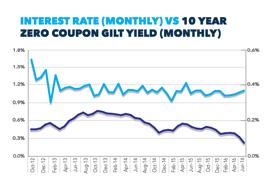 The bridging sector consistently offers far higher returns than Government bonds, with the Brexit vote pushing gilts yields down further. Bridgineturn of 1.14% in July, compared to just 0.08% on Gilts. Danny Waters, Chief Executive of Enra Group concludes: “The short-term finance sector has succeeded in growing despite economic uncertainty. 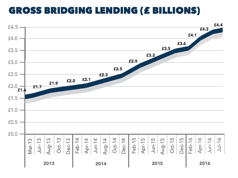 Breaking through the £4bn barrier is a significant achievement for short-term lenders. 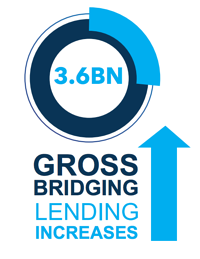 With gross annual lending only passing £2bn in April 2014, bridging lending has doubled in the last two years. Short-term finance now has a much more prominent role in the wider financial sector, with far more borrowers making use of the speed and flexibility of bridging loans. The nature of bridging allows customers to meet a much wider variety of financing needs. For investors, with traditional fixed-income investments offering uncertain returns, such as miniscule Government bond yields, short-term finance should be a serious consideration. Those lenders in the sector who are maintaining safe and sensible lending practices, will represent investment opportunities that are resilient enough to navigate through any future Brexit turbulence.